Often when we think about anti-ageing or Ageing Slowly as we call it at Skin Essentials, the focus is on wrinkles, whether reversing the appearance and depth of ones already there or preventing them in the first place. But there is so much more to anti-ageing than wrinkle management! I would even go so far as to say that lines and wrinkles are not the most visibly ageing factor I see on skin. If I had to choose (not that I want to) between eradicating lines or eradicating dullness I would opt for the second choice every time. Every skin looks more youthful, vital and beautiful when it is radiant, regardless of whether there are lines and wrinkles present or not. My top treatment choice for restoring radiance is with customised peels. Read about them here. For an added boost, LED light therapy is a gentle yet powerful way to stimulate skin’s natural processes and reveal radiance. Another factor that subtly adds to the visible ageing of our faces is colour anomalies such as visible red veins or capillaries and brown sun spots. 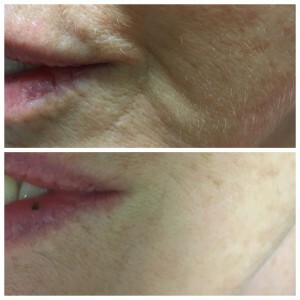 The good news is that these can be treated very quickly and easily with diathermy or cryotherapy to restore an even complexion. Finally in my trio of silent agers is the down-turning of the corners of the lips that occurs so gradually with natural ageing that we are hardly aware of it, but restoring the volume in this area with needle-free hyaluronic acid filler can have a huge effect on the overall appearance of the face – without looking like you have had anything done. See an example from one of our hydroporation clients in the photo below. And of course we can tighten skin and reduce lines and wrinkles with my personal favourite treatment – bio-therapeutic needling. An absolute MUST if you want to prevent or rewind lines, and who doesn’t? Each individual will likely need a combination of two or more of these treatments to effectively manage ALL the signs of ageing. We can create a bespoke plan for you taking in to account your unique skin history and lifestyle influences. Give us a call on 053 9145981 to begin your personalised Age Slowly Plan today or book an appointment online here. This entry was posted in Advice and tagged anti ageing, expert tips, lip lines, milia, red veins, skin essentials, skin tags, skincare, wexford, wrinkles on 25/10/2017 by mariga.